Bagyong “Ferdie” continues moving out from the Philippine Area of Responsibility (PAR), weather forescaster said on Philippine Atmospheric, Geophysical and Astronomical Services Administration (PAGASA) late Saturday night. PAGASA weather forecast as of 10:30 p.m. of July 21, "Tropical Depression Ferdie was last spotted 350 kilometers (kms) west northwest of Laoag City." And local weather expert lowered all public storm warnings. 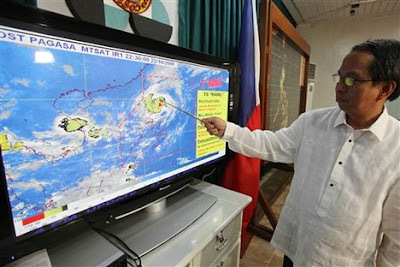 Meanwhile, PAGASA said, "Bagyong Ferdie is expected to be at 650 kms west northwest of Laoag City by Sunday evening." PAGASA posted on their site, "As of today, there is no tropical cyclone existing within the Philippine Area of Responsibility (PAR). " Comments or suggestions about "Bagyong Ferdie Update - July 22, 2012" is important to us, you may share it by using the comment box below.